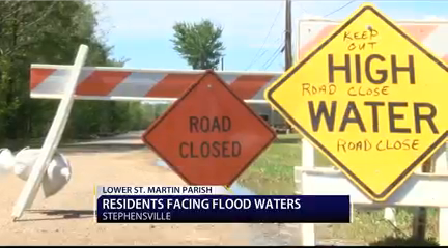 STEPHENSVILLE- The St. Martin Parish Sheriff’s Office is warning people in the Stephensville area of flooding. Trying to get the word out to drivers to avoid Four Mile Bayou Road as well as Adell, Landry and Edna streets. Driving through those streets will only make things worse than the already are. “When there’s no place for it to go, unfortunately this is where it ends up,” says Major Ginny Higgins, P.I.O. for the St. Martin Parish Sheriff’s office. In the spring, showers bring flowers. In lower St. Martin Parish, where water is all around you, showers just mean flooding. The Sheriff’s office wants to do its part in keeping residents here prepared. Where, when and how much it floods varies from year to year, of course. But for folks living in lower St. Martin parish, dealing with flooding like this is just a way of life. Residents here would probably prefer you to not take the scenic route through their neighborhoods. “It floods their roadways and makes it difficult to get in and out,” adds Higgins. Being prepared and blocking off roads are about the only things one can do when the fight is against nature. Free sand is available for pickup at the Stephensville Park on Hwy 70.